“He doesn’t listen to me.” Not only is that one of the most common complaints that my wife, Pamela, has had in our marriage, it is also one we frequently hear about from other couples. But, there is a way to overcome this struggle. One of the best strategies for learning to listen well in our marriage has come from Dr. John Gottman. He refers to the practice as ATTUNEMENT. The process is not rocket science, but its impact is powerful. Just as it takes a few regular adjustments to tune your favorite radio station in while on a car ride, listening well involves more than just not talking. There is a focusing or tuning of self that is required to engage the type of listening a wife really needs from her husband. 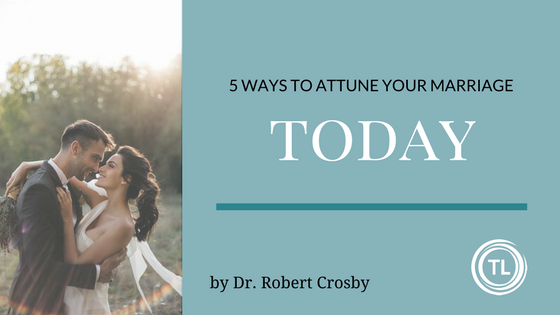 5 Ways to A-TT-U-N-E Your Marriage! (A) ATTEND to the needs of your wife. When you provide focused attention to your wife, it also feels like affection. Remember, to her attention is affection. (TT) TURN TOWARDS your wife. Women desire face-to-face interactions. Men, on the other hand, tend to focus more on side-by-side relationships, such as playing golf or going fishing together with a friend. The result of such cultural grooming is that most men do not have a close male friend. Men struggle to break beyond having mere acquaintances, beyond only competing as buddies on a battlefield or golf course. So, husband, listening the way your wife needs you to listen is going to be something different than just another few minutes of golf. She needs you to turn towards her physically and emotionally. (U) UNDERSTAND – It is important to ask questions about how or what she is feeling. Remember, as the Prayer of St. Francis, to seek to “understand”, not just be “understood.” That will require some time and consideration of not only what she thinks, but thinking more about how she must feel. This kind of attention is almost irresistible to her. While you may think of it merely as “extra effort” or “work” to listen so hard, she feels it as love, true love. (N) NONDEFENSIVELY LISTEN – Remember to respond, don’t react, to what you hear. Even if she is upset, hear her clearly and hear her through. Listen and respond. If her words tap a frustration or negative emotion in you, don’t let it coopt your equilibrium. Breathe and calm yourself down if you feel the urge to react or overreact to what you hear. (E) EMPATHIZE – When you listen long enough that what you hear from your wife goes beyond a simple auditory processing and turns into an emotional understanding, then your 3rd Ear is fully engaged. That’s what she is looking for from you and sometimes desperately needs. You become the person who will listen to hear as will no one else, her friend and her spouse in those moments becomes her soulmate. Gottman says that “Neurologists have found that the emotional part of the brain calms down as soon as it feels connected to another person and not alone.” Remember, the most important thing in these moments is not who is right or who is wrong, but more so about the two of you being in Oneness as a couple.